The paintings by former Auschwitz inmate David Olère, who claims to have lived in one of the Birkenau crematories for almost two years, give an artistic rendering of the general theme that pervades Auschwitz survivor statements. I give here only one example of the many Olère has drawn and painted, see Ill. 1. Ill. 1: "Inmates Hauling a Wagon Loaded with Victims' Belongings", drawing by David Olère, where thick smoke can be seen rising from two crematory chimneys in the background. Also according to witness statements, the Birkenau crematories are said to have been in basically uninterrupted operation from May 1944 into the late summer of 1944, when the Nazis are said to have exterminated up to half a million Jews from Hungary and up to 70,000 Jews from the Lodz Ghetto. At the same time, Allied reconnaissance airplanes took several air photos of the camp. Hence, if the witnesses’ claims were true, we would expect to see thick smoke emanating from at least some of the crematory chimneys on at least some of these photos. In his trail-blazing work on air photo evidence about the Holocaust – or rather the lack thereof – John C. Ball has reproduced several of these reconnaissance photos which had been released to the public by that time. He posited that none of them show any smoke-emitting crematory chimneys. Ill. 2: Carlo Mattogno's Doc. 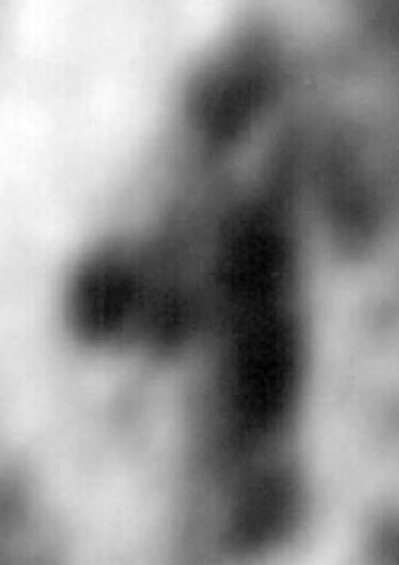 35 with his arrow allegedly pointing to smoke rising from the chimney of Crematory III at Auschwitz-Birkenau. Note the multitude of scratches on that photo running parallel to this line. The second frame shows the same location, but taken from the image of Aug. 23. Click for a larger version of the first frame. 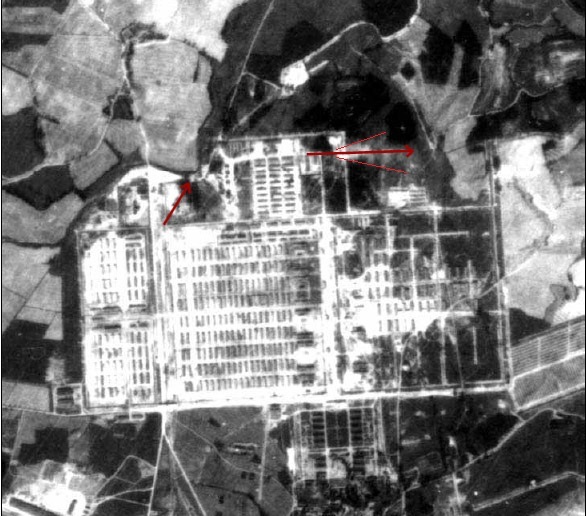 However, in his impressive 2005 work on open-air incinerations at Auschwitz, Carlo Mattogno hypothesized that one air photo taken by a Canadian reconnaissance airplane on August 20, 1944, over the Birkenau camp “shows a dense column of smoke rising in a spiral from the chimney of crematorium III.” See Illustration 2. 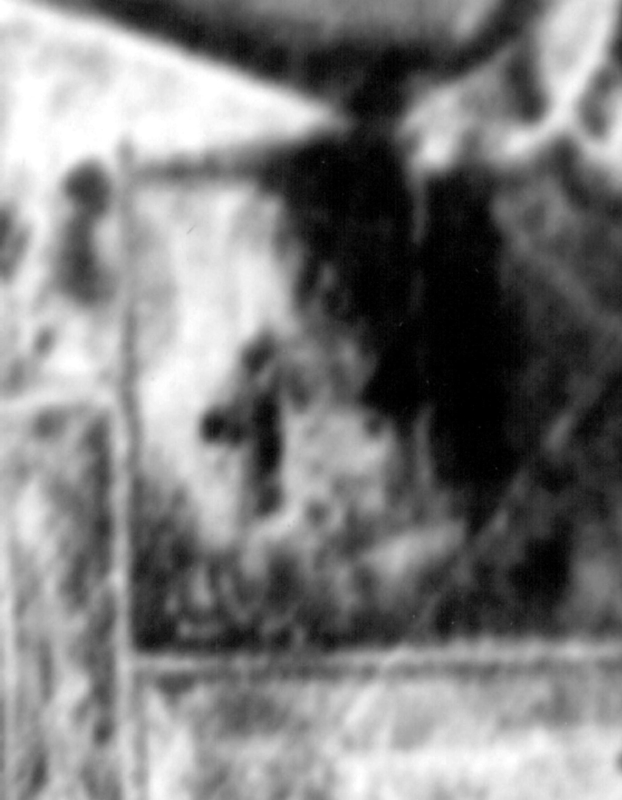 Ill. 3: A section enlargement of the air photo of Aug. 20, 1944, showing Crematory III and its vicinity. The second frame has a few of the parallel scratches marked with thin red lines. Although I do not wish to argue here that coke-fired crematory chimneys of that era did not emit smoke, I will show in the following that Mattogno’s air photo evidence is flawed. In fact, what is visible on that particular air photo is not smoke from a chimney, as Mattogno claimed (see my Ill. 1), but rather a defect in the photograph. The actual chimney is located roughly in the center of the side wing of the crematory building, which extends towardsthe left on the photo. Yet the bright, hence thickest part of the alleged “smoke” is located on the roof of the building’s main wing, some 10 meters away from the actual chimney location. There is no bright smudge above the chimney itself. I posit that it is quite impossible for a coke-fired crematory to emit smoke in occasional spurts, leading in this instance to its most conspicuous visibility some 10 m away from the source. The smoke should actually be more visible closer to the source rather than not visible at all. Smoke rising from a chimney always produces a conical shape (or a triangle on a 2D projection = photo), which widens with increasing distance from the source. But if we take an even closer look at the image, Ill. 4, it turns out this “smoke” appears to be tapering off with increasing distance from the chimney. Real smoke behaves differently: It is thick and focused at the source, but thins out and widens in the distance. To prove that point, see the actual smoke cone rising from the yard of Crematory V, see Ill. 4. This brings up my final point. The wind direction on this photo is from the south to north as shown by the real smoke coming from the yard of Crematory V, but this alleged “smoke” coming from Crematory III has a direction from southeast to northwest, parallel to all the other scratches. See the arrows on Ill. 5. My conclusion is therefore that this is only an error/artifact on the photo, since the entire photo is covered by these slanted scratch lines in the same direction as the one marked by a red arrow over Crematory III. One of these scratches anomalously produced the illusion of smoke rising from that chimney. Ill. 5: Mattogno's Doc. 34, from which his Doc. 35 was taken (my Ill. 1): The direction of the alleged smoke rising from Crematory III (short red arrow to the left) is from southeast to northwest, whereas the direction of the smoke rising from the yard of Crematory V is roughly from south to north (long red arrow, center top). Hence, as of this day there is not a single known air photo of Auschwitz-Birkenau showing smoke coming out of any of the crematories. Yet there are several showing smoke billowing from a limited area in the yard of Crematory V, as for instance also on the one shot three days later, on Aug. 23, 1944, and on one taken on July 8 of that year. 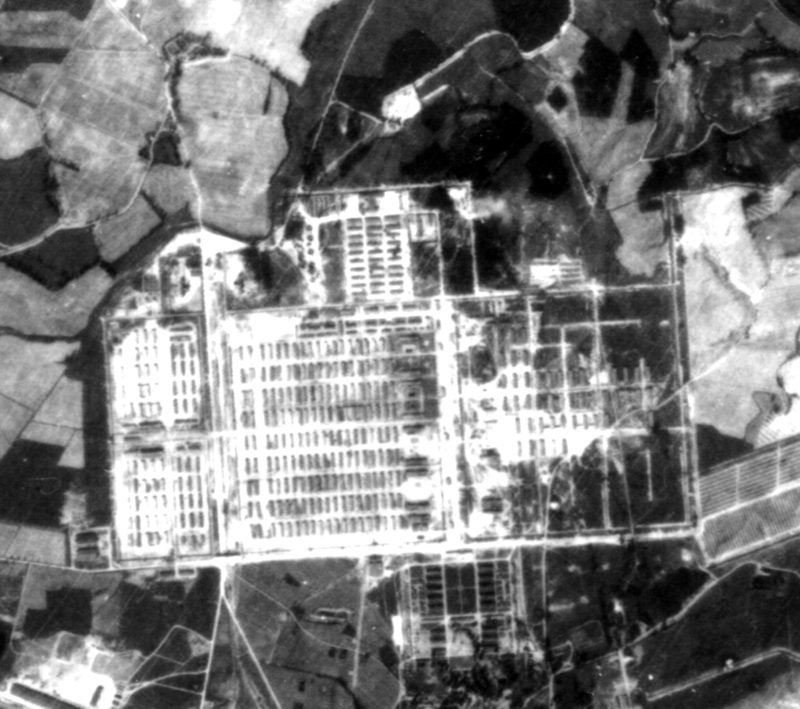 Aerial photography is unable to prove that witness statements of profusely smoking crematory chimneys at Auschwitz-Birkenau are accurate. In fact, the absense of smoke in these photographs suggests just the opposite. District Court of Ontario. Between: Her Majesty the Queen and Ernst Zündel. Before: The Honourable Judge H.R. Locke and Jury (verbal record of the “first Zündel” trial of 1985), p. 315; similar on pp. 326, 344, 347; cf. Michael Hoffmann, The Great Holocaust Trial, 3rd ed., Wiswell Ruffin House, Dresden, NY, 1995, pp. 45-47. 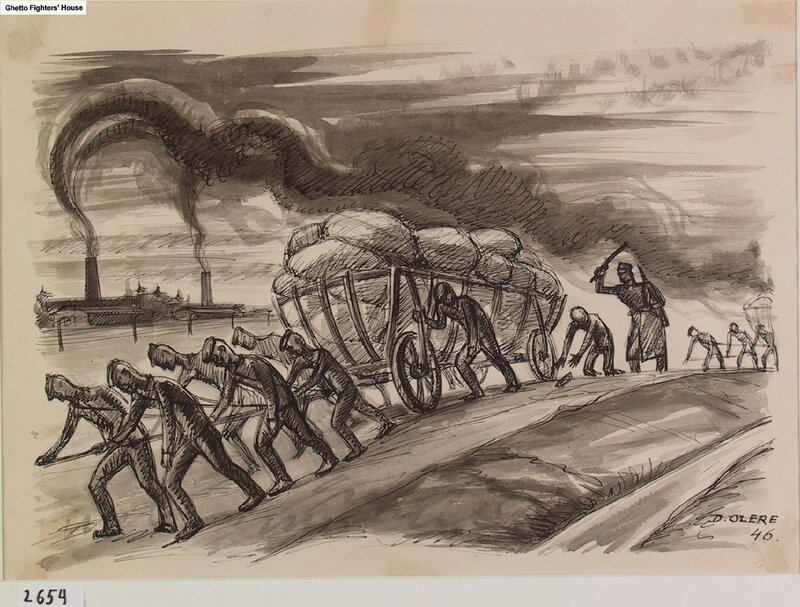 To see more of Olères's artwork, see at http://fcit.usf.edu/holocaust/resource/gallery/olere.htm or search the Ghetto Fighters House Archive for his name, where the one reproduced here can also be found. John C. Ball, Air Photo Evidence, publ. by author, Delta, B.C., 1992, esp. pp. 64f. Carlo Mattogno, Auschwitz: Open Air Incinerations, Theses & Dissertations Press, Chicago 2005, p. 64, referring to Doc. 34f. on pp. 115f. Note: the photo enlargement on p. 116 wrongly refers back to Doc. 31; it should be Doc. 34. Ibid., Doc. 36, p. 117. Ibid., Docs. 33 & 38, p. 114, 119.